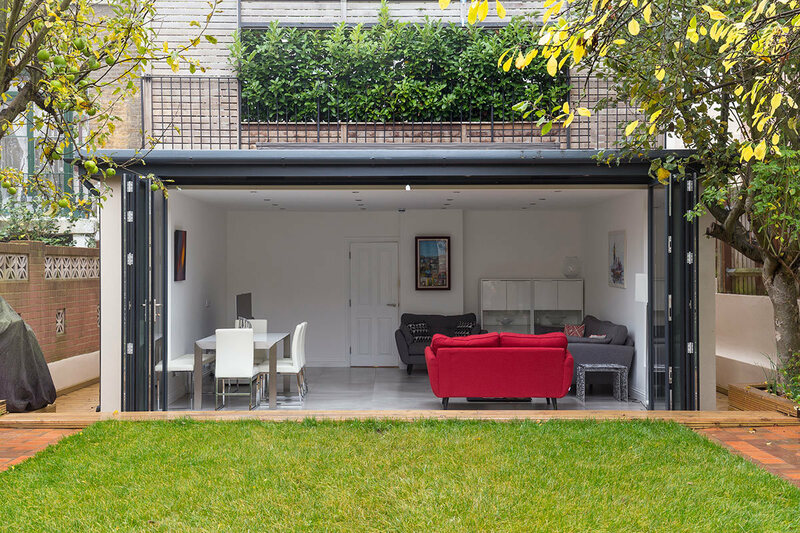 The clients purchased this property with a rear extension already in place, but the layout of the home wasn’t intuitive and was in dire need of a makeover. They wanted to completely redevelop the space, connecting the rooms, and allow for better functionality. So we rolled up our sleeves and got stuck in. 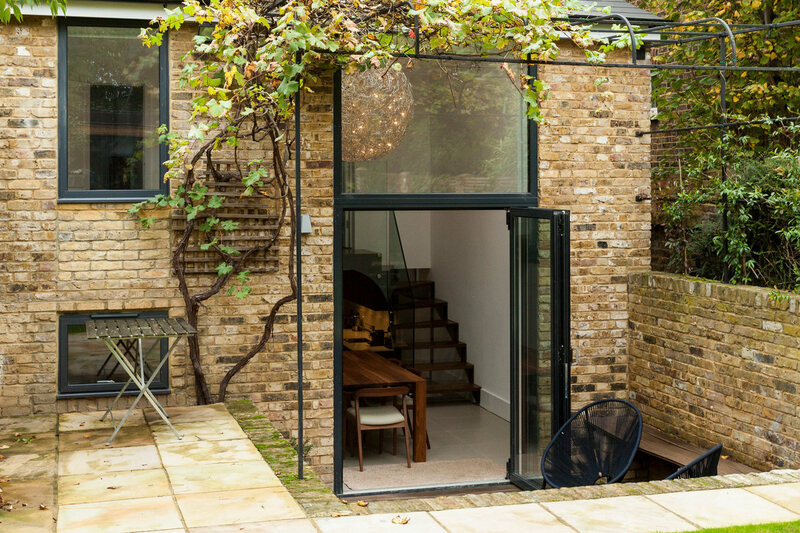 To begin with, we wanted to open up the rear of house, and bring in some much needed light. 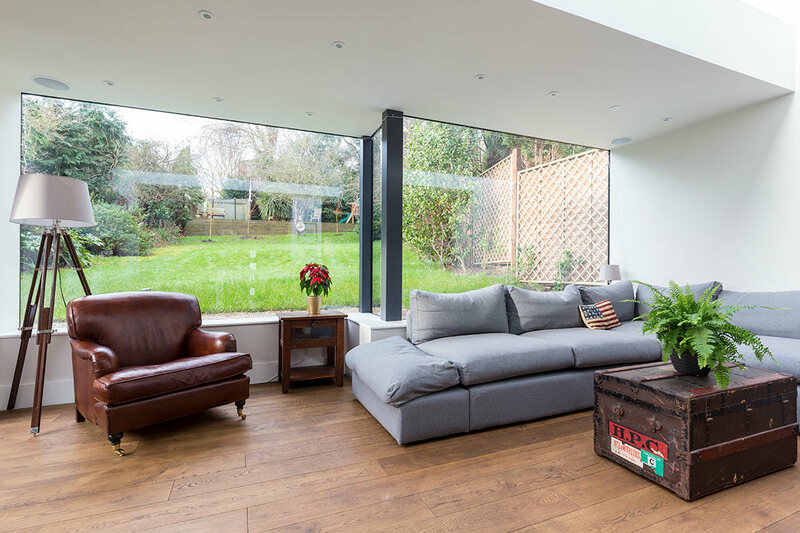 Therefore, we designed the rear facade to have large windows, complete with floor to ceiling glazed doors. We were able to install all these through the homeowner’s permitted development rights, avoiding the need for planning permission. 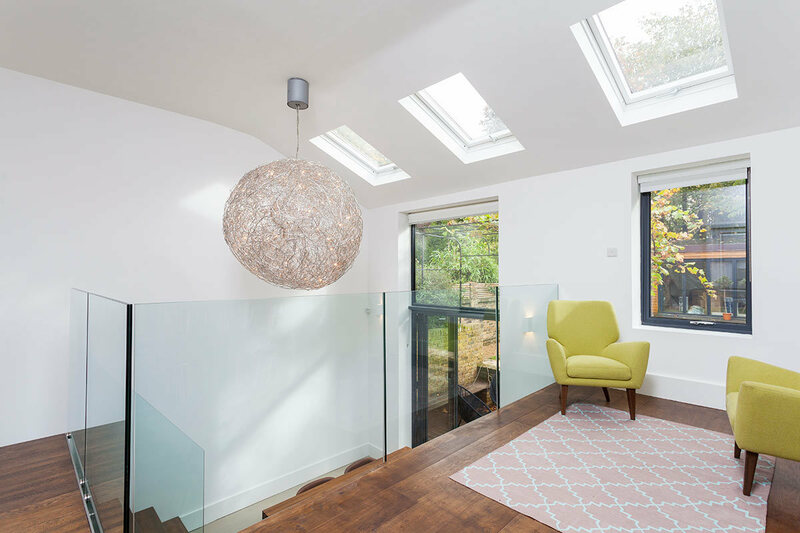 To give a contemporary twist to the building, we also wove aluminium sections into the building along the windows, and roof. Inside, we kept up our homage to natural light, and installed a trio of skylights. 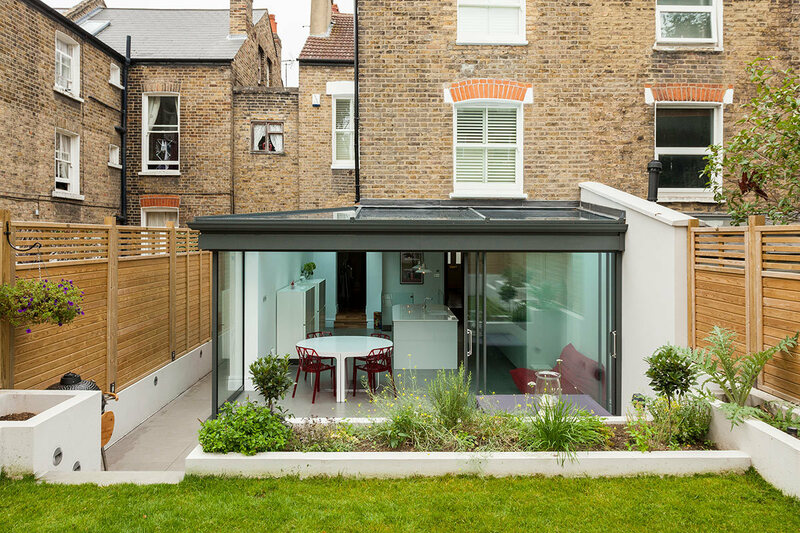 This allows light to penetrate all through the height of the space, brightening both levels. And with such beautiful views of the garden, we decided it would be a waste to not utilise every inch of the area. Therefore we transformed the top of the stairs into a library. A perfect reading nook on rainy days, as the water pitter patters on the glass. As for the stairs, our client was keen to make these a real WOW factor in the home. As such, these were custom made, giving a high-quality finish to the home. 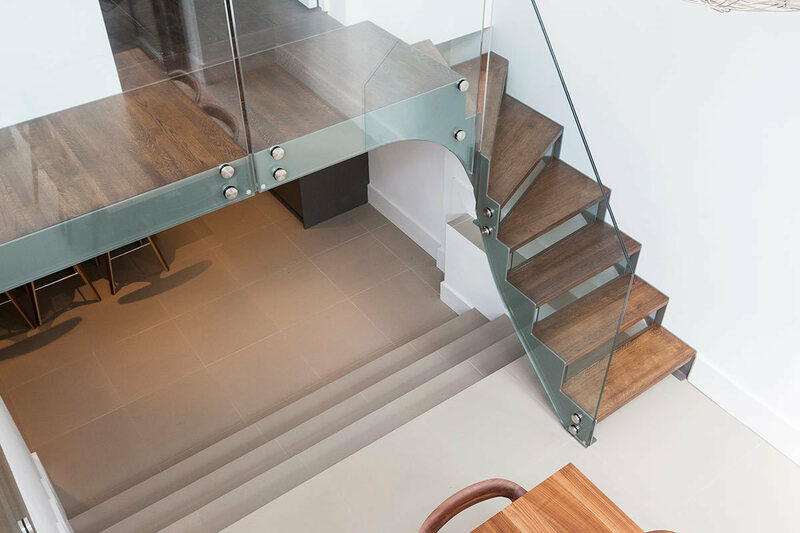 These stairs truly make a statement, with dark hardwood and galvanised steel details - complete with exposed bulks. 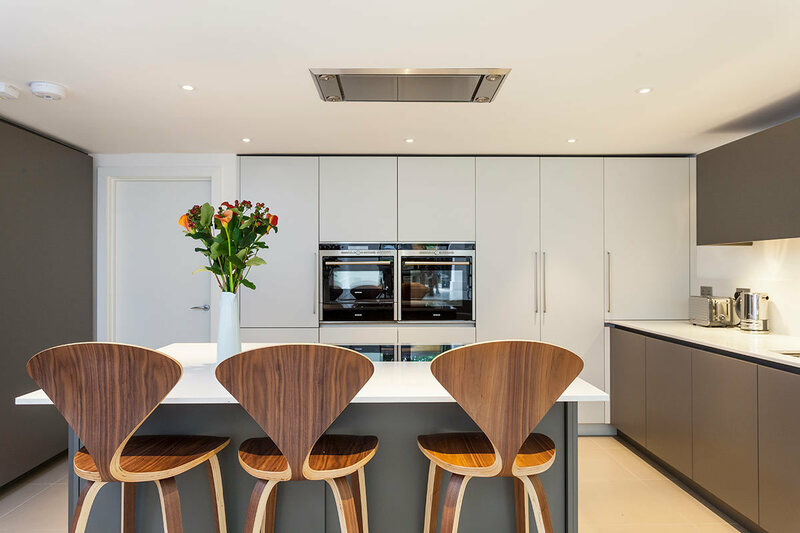 Our favourite detail of these stairs is that the positioning of the steps allows for uninterrupted views from the kitchen to garden. Meaning the space keeps the flow and connectivity to the outdoors. And as a final touch, we designed a glass banister to wrap all along the stairs and into the library. Our dedication to good natural light really pays off in the kitchen. Nestled in the basement of the house, it would be easy for this space to feel closed off and dark. 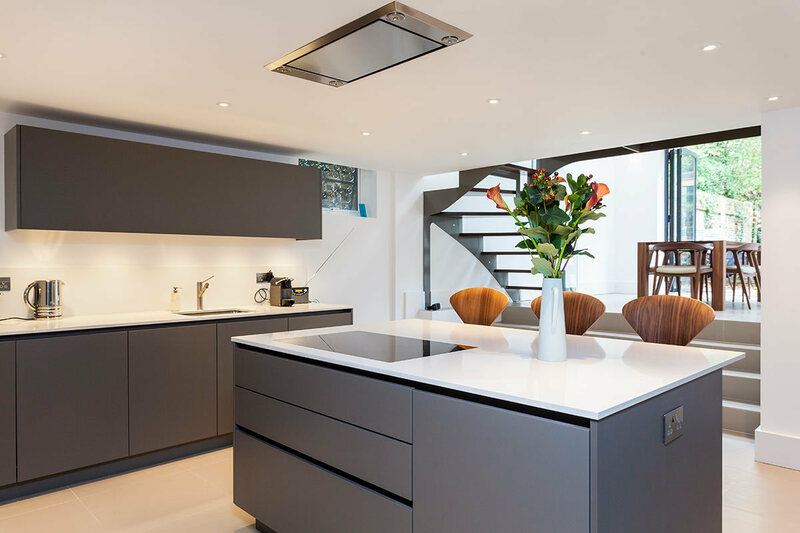 However, thanks to the large sets of glazing, and bespoke stairs, anyone cooking here can still enjoy a sense of bright openness. Complete with an island for breakfast time, the minimal design and strategic use of built-in lighting in the fixtures, makes this a classic design, sure to stand the test of time.